Syria Daily: Did Assad Regime Stage Attack on Its Own Hospital in Aleppo? The positions rebels took today are important for the regime, because the ground lost covers their staging area for the planned offensive towards [opposition-held] Idlib Province and the Turkish border. A cut off of the last rebel supply route will be far more difficult. UPDATE 1600 GMT: Perhaps recognizing the flaws in its earlier account, Syrian State media has altered the story of the explosion at the al-Dhabeet Maternity Hospital in west Aleppo. State outlets originally claimed a rocket attack, but opposition journalists noted that rebel positions are out of range for such an assault. Activists also cited evidence from photographs of a car bomb as the cause. State news agency SANA now claims that a shell struck the fuel tank of a military vehicle near the hospital, causing an explosion which badly damaged the building. However, the director of the hospital, Sami Dabbit, said in a post on his Facebook page that the explosion was a “blast” — indicating a bomb — rather than a rocket or missile. Despite the contradictions in the regime account — and possibly working off outdated information — US Secretary of State John Kerry condemned the attack and said a “missile” appeared to have been fired from rebel-controlled territory. Meanwhile in New York, the UN Security Council unanimously adopted a resolution to remind parties of rules during wartime, demanding protection for those who provide health care and accountability for those who carry out attacks. UPDATE 1200 GMT: State news agency SANA is claiming that three people have been killed and 17 wounded in a rocket attack on the al-Dhabeet Maternity Hospital in regime-held west Aleppo. The opposition Halab News Network says that the explosion was caused by a car bomb, and that some activists believe the incident was staged to divert attention from the Assad regime’s bombing of opposition-held east Aleppo. 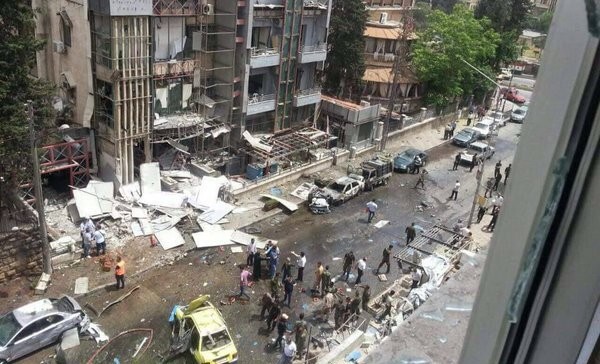 According to opposition site Eldorar, witnesses said regime intelligence quickly surrounded the hospital after the explosion, imposing a security cordon and taking several photos to claim that “rockets” caused the damage. However, images from a mobile phone showed a car which appeared to have been overturned and destroyed by a bomb within it. There are no holes around the hospital pointing to the impact of a rocket, while damaged windows on lower floors could be from the imact of a bomb. A paramedic treating the injured said the explosion was sudden was not preceded by a whistling sound associated with a rocket or artillery shelling. UPDATE 1155 GMT: Rebels have detonated a tunnel bomb under a compound for pro-Assad forces in northwest Aleppo. The explosion was in the al-Zahra district, where fighting has been ongoing for months near the destroyed Air Force Intelligence building. Rebel sources said eight regime troops, including officers, were killed by the bomb. Rebels claim that they have captured positions and inflicted heavy casualties on regime forces in the latest battles. Meanwhile, the Assad regime has renewed bombing of opposition-held areas of east Aleppo and the city’s suburbs. ORIGINAL ENTRY: US Secretary of State John Kerry, hoping for a renewal of the February 27 “cessation of hostilities” agreement, has blamed both sides in Syria’s five-year conflict. Speaking in Geneva on Monday after a meeting with UN envoy Staffan de Mistura, Kerry also absolved Russia of any responsibility for the recent bombing that has killed hundreds of civilians and medical personnel in and near Aleppo city. So both sides – the opposition and the regime – have contributed to this chaos. And we are working over these next hours intensely in order to try to restore the cessation of hostilities, and at the same time to raise the level of accountability that will accompany the day-to-day process of implementing the ceasefire. To that effect Russia and the United States have agreed that there will be additional personnel who will work from here in Geneva on a daily basis, 24/7, in order to – 24 hours a day, 7 days a week – in order to try to make sure that there is a better job and a better ability to be able to enforce the cessation of hostilities day to day. Earlier, before a discussion with Saudi Foreign Minister Adel al-Jubeir, the Secretary of State concentrated on the need to “separate” rebel forces from the jihadists of Jabhat al-Nusra, while al-Jubeir emphasized the “outrage” and “violation of all humanitarian laws” and repeated the demand that President Assad should leave power. Asked at the appearance with de Mistura, “Do you really trust the Russians now?”, Kerry offered no response. The US and Russian Federation, who on the 27th of February were able to do a miracle. Now, that miracle is becoming very fragile – so fragile that it’s really wasting a lot….There is no excuse for not finding again a reinvigorating and reinstalling and re-implementing what has been the only strong message the Syrian people have heard from all of us, that it’s possible to have talks when finally the cessation of hostilities is renewed. The February 27 cessation of hostilities was soon breached by clashes, especially in northwest Syria and the East Ghouta near Damascus. However, on April 21, it collapsed in Aleppo Province with the Russian-regime airstrikes. At least 250 civilians have been killed in opposition-held areas, and at least 540 wounded in more than 320 airstrikes and 65 barrel-bombings as well as surface-to-surface missiles and mortars. The toll eased on Monday, with the Local Coordination Committees verifying only six deaths in Aleppo. State media has claimed that more than 80 people were killed in the regime-controlled parts of Aleppo city from rebel shelling. However, evidence has been limited to photographs of damage to buildings and cars and individual casualties being treated in hospital. State news agency SANA asserts this morning, from a “police source”, that 11 civilians were killed and 37 injured “due to terrorist attacks with rocket shells”. Both Russian and regime outlets have falsely attributed the shelling to the jihadists of Jabhat al-Nusra — excluded from the cessation of hostilities — who have no presence in Aleppo city. Last Friday, the Assad regime declared a short-term “regime of calm” in Latakia Province on the Mediterranean and in East Ghouta. However, the Syrian military quickly renewed its attempt to take opposition territory near Damascus. The regime specifically excluded Aleppo from any truce. The US and Russia supported the “regime of calm”, but Washington did not press initially for any mention of Syria’s largest city. US Secretary of State John Kerry said on Tuesday that the Assad regime must start a political transition by August 1 or face the consequences of a new US approach. If Assad does not adhere to this, there will clearly be repercussions. One of them may be the total destruction of the cease-fire and then go back to war. I don’t think Russia wants that. I don’t think Assad is going to benefit from that. There may be even other repercussions being discussed. That is for the future. Kerry spoke after a meeting between UN envoy Staffan de Mistura and Russian Foreign Minister Sergei Lavrov in Moscow on Tuesday, a day after the Secretary and de Mistura conferred in Geneva (see entry above). If Assad’s strategy is to somehow think he’s going to just carve out Aleppo and carve out a section of the country, I got news for you and for him: This war doesn’t end. As long as Assad is there, the opposition is not going to stop fighting. Assad cannot reunite the country — it’s that simple. Having gassed his people, barrel bombed his people, dropped bombs on hospitals, driven 12 million people out of their homes, tortured people, starved people, what kind of legitimacy should somebody who’s committed these kinds of atrocities suddenly claim to run the country? It’s pretty hard for anybody to understand how you make peace out of that record of chaos and depravity. A beautiful man, he made jokes with the children to make them feel comfortable. He was also loved by the personnel. I feel guilty because Mo’az should have been in Turkey to visit his family, he hadn’t seen his parents for four months. But I had an English exam in Istanbul. We had agreed that He would stay until I got back, otherwise he would have been alive. People just want this war to stop, never mind if they in western of eastern Aleppo, I only came to eastern Aleppo because I was needed here and because I didn’t like the way the government handled things. But when the war stops we will all rebuild Aleppo together, I really believe this. 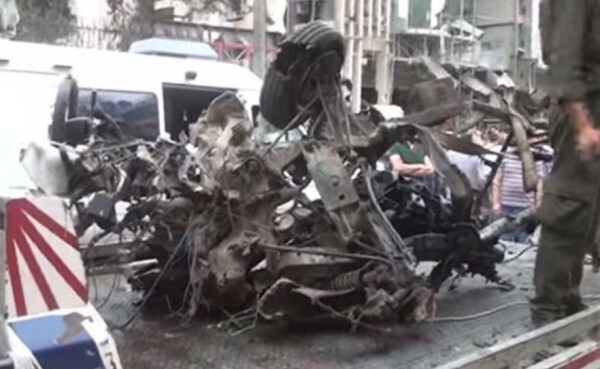 Islamic State rockets have killed another person in the town of Kilis in southeastern Turkey. Others were wounded when two rockets fired from inside Syria landed near a school and in a street, according to a “security source”. The Turkish military responded with artillery fire on ISIS targets. Nineteen people have been killed in Kilis this year by the cross-border rockets. At least five were fired over the weekend, although no casualties were reported. On Sunday, the Turkish military said it killed 34 ISIS fighters with drone and artillery strikes. It said on Tuesday morning that it launched another attack, killing six jihadists.